Syn. : A. leucodontis (Poelt & Döbbeler) Coppins, Catillaria melanobola f. frullaniae B. de Lesd. 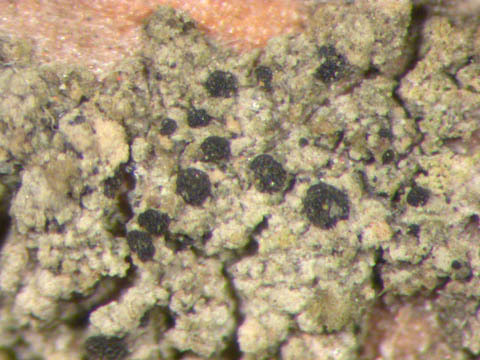 On bark of Lycium, Malus, Salix and Ulmus in ruderal conditions, often over corticolous mosses, also overgrowing the thalli of Bacidina chloroticula on living leaves of Buxus. Belgium: Mosan: RR, Ard. : RR. France: Mar. : RR (type locality of C. melanobola f. frullaniae). Lit. : Boul. : 66, Di: 41, L5: 9-10, NL84: 11, NL97: 44, Coppins (1989: 203), Sérusiaux (1996: 220), van den Boom & Sérusiaux (1996: 21).